Earlier this week, legendary British hard rockers DEEP PURPLE canceled the two shows they were scheduled to play in Sweden (Tuesday, June 14 at Gröna Lund in Stockholm and Wednesday, June 15 at Liseberg in Gothenburg) after one of the bandmembers became ill.
"To all the people who were expecting to see DEEP PURPLE in Sweden and Denmark this week, I would like to let you know the reason the shows were not possible,and also to stop all the speculation and rumours. "On the morning of the 14th of June, I woke up to find that the right side of my body was feeling numb and I could not control my right hand and fingers. So I had myself admitted to hospital where I was diagnosed with having suffered a 'mini-stroke' or TIA. The hospital staff in Stockholm were amazing and started my treatment straight away. "After both CT and MIR scans, there was found to be no serious or permanent damage. As of this moment, all I am suffering is a slightly numb right side of the face a tingling sensation in my right hand. My dexterity in the hand is coming back quickly and I fully expect to recommence touring next month. So now I have a set of tablets which have to be taken every day to ensure it doesn't happen again!. "So sorry for not being able to play for you. And I'm sorry for myself! "These are the first shows I have missed with DEEP PURPLE since its formation in 1968. "Thanks to all the people who have shown concern and sent their best wishes." 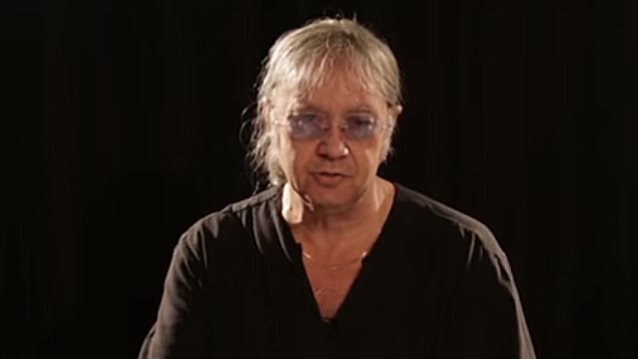 DEEP PURPLE recently finished recording its new album for a late 2016 release. The follow-up to 2013's "Now What?! ", which was tracked earlier this year at a studio in Nashville, Tennesse, was once again helmed by Bob Ezrin, who has previously worked with KISS, PINK FLOYD, PETER GABRIEL, ALICE COOPER and KANSAS, among others. DEEP PURPLE's first new album in eight years, "Now What?! ", topped charts in Germany, Norway and Austria and peaked at No. 19 in Britain. DEEP PURPLE — which has been eligible for induction into the Rock And Roll Hall Of Fame for two decades now — finally entered the Rock Hall as part of the class of 2016. The band's first three lineups were inducted, including drummer Ian Paice, guitarist Ritchie Blackmore, late keyboardist Jon Lord, and various singers and bassists — Rod Evans; Ian Gillan and Roger Glover; and David Coverdale and Glenn Hughes.